Gifts from a will or living trust are among the most common and most impactful planned gifts. Below you’ll find information regarding the benefits of these gifts and how they’re facilitated. A distribution of assets to a charitable organization after someone’s lifetime is also known as a bequest. Bequests are often made through a will or living trust. At St. Olaf, donors typically make general bequests or designated bequests. General bequests are unrestricted gifts supporting all aspects of the college. Designated bequests are gifts directed to a specific fund, initiative, or purpose such as an endowed scholarship, academic programming, or athletics. Accurately name St. Olaf College as a charitable organization receiving a gift. Ensure timely distribution of your assets. Reduce taxes and other expenses associated with settling an estate. Give a percentage of your estate’s remainder value. Give a specific dollar amount from your estate. Support a special initiative or program at St. Olaf. … _____% of my residuary estate to be used where the need is greatest. … the sum of $______ to be used where the need is greatest. … _____% of my residuary estate to be used for the __________________. …the sum of $______ to be used for the _________________________. Some donors will make a contingency bequest, which allows you to leave a portion of your estate to charitable interests if one or more named beneficiaries–spouse, family member, et al–do not survive you. To accurately document a contingency bequest tailored to your needs, please consult a legal professional. As your legal adviser may wish to include it in your will or trust documents, our federal tax ID number is 41-0693979. Our Minnesota tax ID number is 20133. Is St. Olaf already included in your estate plans? 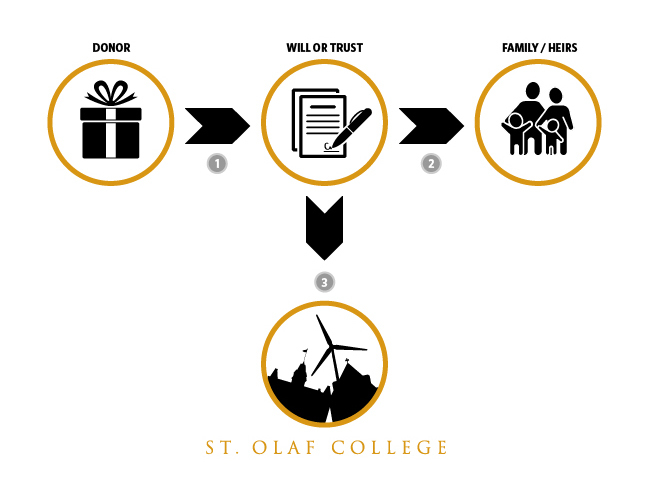 Sharing the details of your gift with us is beneficial to you, St. Olaf, and future donors. Plus, it’s entirely confidential. Learn how to share your intent. Ready to speak to someone on staff? Contact us at 800-776-6523 or plannedgiving@stolaf.edu. This is not intended as legal advice. The assistance of an attorney in the preparation of your will or codicil is recommended. John included St. Olaf in his will, enhancing access, affordability, and opportunity for future Oles. As a St. Olaf student, Beth studied music while immersed in the liberal arts. To honor that experience, she included St. Olaf in her will.